Most of my technical readers now use e-books instead of paper books. Of course, there is a convenience factor to storing your entire library on a Kindle, even if it’s a software version of the Kindle. Of course, there are all sorts of e-book formats for your desktop system as well. The point is that electronic format makes a lot of sense when dealing with technical books. However, e-books can cause some interesting problems and I’ve encountered a few with a number of readers now. The most important consideration is that you can’t cut and paste code from an e-book directly into your IDE and expect it to work. There are all sorts of reasons for this exclusion. For example, cutting and pasting may insert special characters into the output stream or the resulting paste may not have white space in the right places. A common problem is that publishers often convert regular single and double quotes into curly quote equivalents. The two kinds of quotes (both single and double) are completely different and the second type definitely won’t compile. The best option when working with an e-book is to view the code in the e-book, but still get the downloadable source code for the book from the publishers website. I always provide a blog post detailing where to obtain the downloadable source for a book, when you need source code to use the book. If you can’t find the downloadable source, always feel free to contact me at John@JohnMuellerBooks.com. I want to be sure you have a great reading experience, which means having source code that actually runs in your development environment. Another potential problem with e-books is that you may see unfortunate code breaks (despite the efforts of the publisher and myself). When you need to understand how white space works with a programming language, always review the downloadable source. The fact that the downloadable source compiles and runs tells you that all the of white space is in the right place and of the correct type. Typing the source code directly out of your e-book could result in added carriage returns or other white space errors that will cause the code to fail, even though the commands, variables, and other parts of the code are all correct. As always, I’m open to your questions about my books. If you don’t understand how things work, please contact me—that’s why I’m here. Is Bring Your Own Device (BYOD) Going Away? In reading other articles, you might be the idea that BYOD is actually exploding. The problem with these articles is that they’re based on supposition, not fact. There is no data to back up the claim that BYOD is becoming more prevalent in the workplace. Therein lies the problem. The only official surveys talk to IT personnel on the record and not to users off the record. No one would admit to using a disallowed device—potentially throwing their job away over the purity of information. Human nature being what it is, my feeling is that people are probably employing BYOD when they feel they can get away with it. After all, why use multiple devices to perform work when a single device does it all? Users don’t care about hardware, software, data, or anything else for that matter. They care about getting their work done, getting off on time, and getting paid—end of question. Consequently, it makes sense that if users feel that it’s possible to get by using a single device to do everything, they’ll do so. However, I have absolutely no data to back this feeling up and you have to accept my claim for what it is—a feeling. Something that I’ve been emphasizing in my books is this idea of risk. In order to create applications that work well, yet protect organizational assets, it’s important to assess the risk of every policy and every action. Being overly cautious means that applications will work slowly, lack features, and possibly crash a lot. Users don’t like cautious applications and won’t use them if at all possible. Opening the flood gates is a bad idea too. Yes, the application will run quickly and allow a user to do just about anything, but the user won’t thank you for having to stay extra hours at work to fix problems created by an application that loses data or causes other problems because it doesn’t provide an acceptable level of risk avoidance. No matter what survey you look at, BYOD is still a presence in the workplace, so you need to write applications in such a manner that they deal with the risks presented by BYOD in a reasonable manner. What this means is checking every bit of data you receive from anywhere for potential risks, but not unnecessarily hobbling the user with policies that really won’t mitigate any risk. Let me know your thoughts on the effects of BYOD in your organization and the actual level of BYOD use at John@JohnMuellerBooks.com. When I originally wrote each of these books, I had at least one technical editor and a number of beta readers checking my code under various conditions to ensure the code would run as advertised on the maximum number of systems. I no longer have the support, so I’m testing these updates on just my systems. If you encounter a problem with the source code of any of these books, please be sure to contact me at John@JohnMuellerBooks.com. Now, here’s the important part. 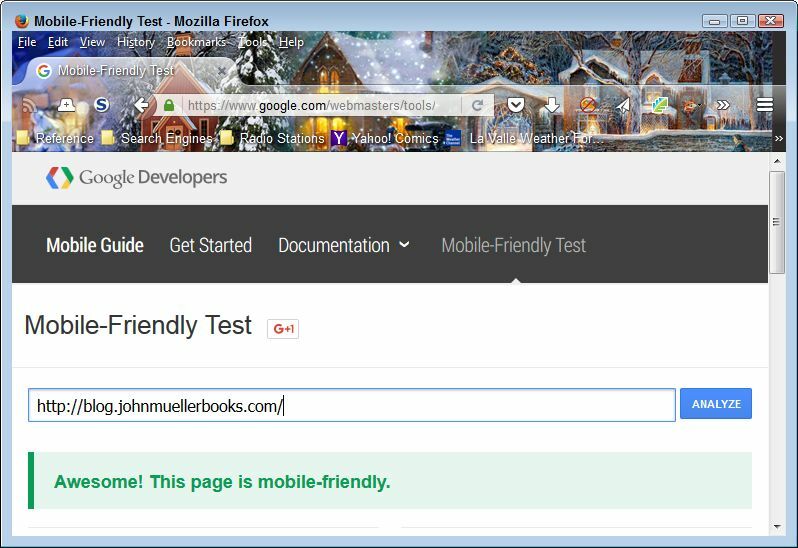 Make absolutely certain to let me know that you’re using a newer browser—one not originally tested in the book so I can handle your query correctly and also provide an update on my blog. Your input will help other readers. Whenever possible, I encourage readers to use the environment described in the book to write their own code. Doing so reduces the potential for problems because I know that the environment is tested by a number of people in a number of environments. However, sometimes using the original environment isn’t possible any longer, such as this instance where Microsoft is putting its collective foot down and forcing an update. Please be sure to write me if you have any questions about the source code for these book. Thanks, as always, for your continued support! While I was writing Security for Web Developers I considered a great many security scenarios that web developers (and those who work with them) have to face. It always seems as if the hackers are two steps ahead. Of course, one of the biggest problems is static technology. For example, the Credit Verification Value (CVV), a three or four digit addition to a credit card number, is supposed to help safeguard the credit card. It doesn’t appear as part of the card data accessible through the magnetic strip or the chip. The CVV is actually printed on the card as a separate verification for venues such as web applications. The only problem is that this number is static—it remains the same for however long you own the card. Therefore, once a hacker discovers the CVV, it no longer provides any sort of security to the card owner. Interestingly enough, some sites online will sell you both credit card numbers and their associated CVV. The hackers win again. A solution to this problem is to change the CVV periodically. Unfortunately, trying to change a printed CVV is impossible without replacing the card. One possible way to overcome this problem involves the addition of an e-paper space on the back of the card that would allow the credit card companies to change the CVV, yet keep it out of the magnetic stripe or chip. A lot of devices currently use e-paper, such as Amazon’s Kindle. The technology provides a matte paper-like appearance that reflects light similar to the way in which paper reflects it, rather than emitting light like an LED does. The difference is that e-paper is often easier to read. Oberthur, the inventor of the Motion Code technology used to create the updated CVV, isn’t saying too much about how the technology works. There must be an active connection between the card and a server somewhere in order to update the CVV once an hour as specified in the various articles on the topic. The only problem is in understanding how the update takes place. If the technology relies on something like a Wi-Fi or cell connection, it won’t work in rural areas where these connections aren’t available. Even so, the technology does promise to reduce the amount of fraud that currently occurs—at least, until hackers find a way to thwart it. What is your feeling about credit card data protection? Does Motion Code technology actually provide a promising solution or is it another dead end? How do you deal with potential fraud when creating your applications? Send your ideas to me at John@JohnMuellerBooks.com. A particular problem that developers face when creating web apps is that users are notoriously lax in updating their software. A problem piece of software may make it easy for a hacker to gain access to the system. In some cases, the user will blame your application because it depends on software that could be outdated on the user’s system. A recent InfoWorld article, 10 old, risky applications you should stop using, brings the issue to light. Many of these pieces of software see use in Web apps. You may think that the user will rely on the newest version of the software, but the user may, in fact, have a piece of software that’s several generations old, yet runs your web app just fine. The fear that many users have is that your web app will stop working if they upgrade to newer software. This fear has a strong foundation in broken applications of all sorts in the past. The problem can become quite severe. Looking at the InfoWorld article, you find several interesting bits of information. For example, many existing applications rely on Microsoft XML Core Services 4.x, despite the fact that the software is no longer supported and represents a huge security hole that hackers are only too happy to exploit. If the user removes this software to keep their systems safe, they may also have to give up on one or more mission critical applications. Testing is the developer’s tool of choice in this case. 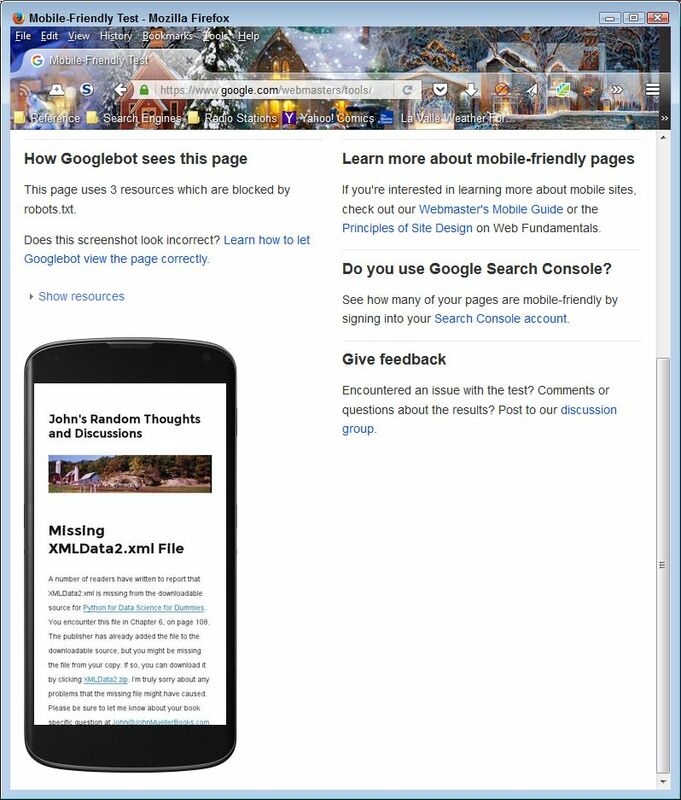 Make sure you test your web apps with the lasted software and then publish the results online. Keep users informed of potential problems and your plan for fixing them so that they can continue making required updates to keep their systems safe. It may not be entirely possibly to fix every security problem immediately. The fact is that software today is so interdependent on every other piece of software that even when your web app has fully supported underpinnings, the software you depend upon may not. The dependencies cascade in convoluted ways that make it entirely possible that a hacker will find a way to breach your application despite your best efforts. Consequently, you not only need to maintain a firm grasp on testing, but also of potential problems with the software used to reduce your development effort and make the application perform better. In short, you need to have a contingency plan in place for those times when a hacker finds a way to break your web app because a determined hacker will fine a way. Outdated software is the bane of developers everywhere, yet users remain clueless as to how much damage they invite by not making required updates. One of the issues that I’m constantly striving to solve in my books is this whole concept of software dependency and how it affects application reliability, security, and speed. If you find that some of the materials I’ve put together are especially helpful (or possibly not helpful enough), please let me know about them at John@JohnMuellerBooks.com. I want to be sure that the security features of my books really do help you past the whole outdated software issue because users really won’t be much help at all. Many other groups appear in the book as well. The more I dug, the more I found that just fixing one problem or educating one group wouldn’t solve anything. Hackers look for easy ways to gain access to applications and the current system provides them with plenty of opportunities. The current strategy of responding to just one potential threat will continue to fail simply because the hacker will move on to another threat. Unless an organization is willing to take a holistic approach to security, hackers will continue to enjoy overwhelming success without a whole lot of work. In writing Security for Web Developers, I attempted to provide a broader view of the security picture so that development teams that include all of the stakeholders involved in an application effort can finally work together to resolve the security issues in their individual areas of expertise (including users who are susceptible to too many kinds of attack to mention). A reader recently asked me whether the strategies in my book will prevent attacks, which is a loaded question and one that is hard to answer. My view of security is that a determined hacker will always gain entrance to your system, so you must remain vigilant at all times. If someone wants your data, they’ll gain access, but if you’re equally vigilant, you can keep the damage to a minimum. For that matter, you might be able to prevent any real damage. However, you need to realize that no security measure you take is going to succeed all the time. What my book does is help make your system less appealing. In other words, if a hacker is just looking for a system to invade and not specifically your system, then making your system less appealing will see the hacker move to other systems. Like anyone else, a hacker seeks to minimize effort and maximize gain. Making your system less appealing by employing a holistic security approach will increase the effort the hacker must employ and make it less likely that the hacker will continue probing. Unless you really want to see your organization’s name join the victim list in the trade press, you really do need to employ security across an organization, which means vetting software fully, educating users, having appropriate policies in place, reviewing software before placing it in production, and so on. Using just one or two measures simply won’t work. Let me know if you have questions regarding my upcoming book at John@JohnMuellerBooks.com.